GEC is organising FREE YOGA CLASS by the river. Everyone is invited to join! With this event, GEC wishes to show everyone the kind of healthy lifestyle we can achieve by having healthy and vibrant rivers near us. You will also learn how to analyse river water quality. Bring your children too. 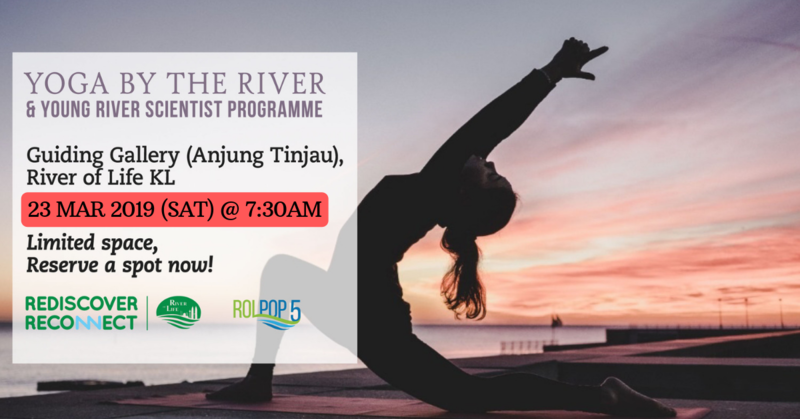 They can participate in the Young River Scientist Workshop while you enjoy an hour of the yoga session. The Young River Scientist Workshop open for kids aged 4 to 12 years old. At this workshop, your children will not only learn about water pollution but every aspect of freshwater ecosystems including its biodiversity, functions, values, and benefits to mankind. Cool right? This event is funded under the River of Life Project Public Outreach Programme Phase 5 (ROLPOP5).